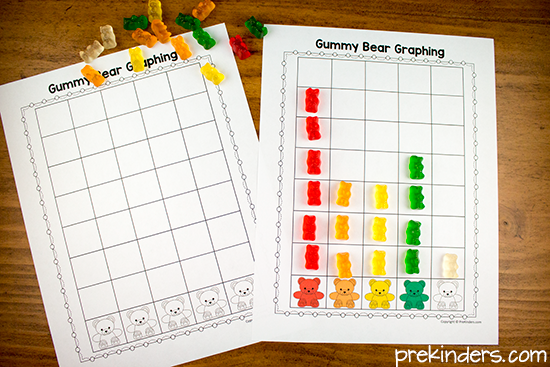 These gummy bear math printables will help your Pre-K and Kindergarten kids practice sorting, counting, and patterns. Its a quick-prep activity (as long as you have gummy bears on hand). Just print the pages, add gummy bears, and you’re ready. I used the “classic” gummy bear colors of red, orange, yellow, green, and clear. These colors won’t be difficult to find, although there are some brands that make other colors. I used Haribo classic colors bears. Children sort their gummy bears onto the bears on the mat, and then count the bears on each color. If you are doing this later in the year, you can have the children write the numbers on each color bear with a dry erase marker. I recommend laminating these mats or slipping them into page protectors, so you can wipe off the sticky candy to reuse year after year. Children place their gummy bears by color on the graph, count how many of each color, and compare colors to see which group has the most, least, or same amount. This set includes the patterns: AB, ABC, AABB, AAB, and ABB. I recommend printing these and laminating so they can be wiped clean if they get sticky. The cards can be cut into individual cards or just leave four to a sheet. Children duplicate the bear pattern by either placing gummy bears directly on top of the bears on the card, or by placing the gummy bears on the table below the pattern card. If you want children to continue a pattern, just have them place bears in a row beside the pattern card. You could even cut the pattern cards in half for children to continue the pattern and then check their answer with the other half. Graphics in these printables by Zip-a-Dee-Doo-Dah. These gummy bear printables are great! I just discovered your site a couple weeks ago and have been so impressed. Thank you for making my pre-k teacher job so much more enriched. Great idea… I hope they can do the activity without eating the gummy bears.. I know it will be lots of fun !!! Joyful and interesting math.I’m sure my students will enjoy. 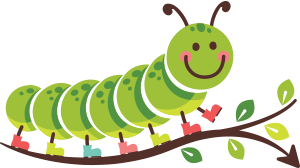 I am new to teaching pre-k this year and I have really enjoyed your resources! Thank you for having a heart to share! Thank you for sharing! What a blessing to offer your wonderful printables! I had major color problems in copying your pages for the gummy bear graphs. The first page with the 5 bears for sorting came out beautifully, but the colors were all wrong on the other pages. I even copied the first page from the printer to see if my ink was the problem, but it also came out great. Has anyone else had problems? What can I do to fix it? Thanks. I love your site. I just printed them out, and they all look fine. Try googling the issue, and see if you can find a fix. I was able to get the correct colors when I printed a page at the time. Somehow the fault is with my system. Thanks for checking it out and getting back to me. I love the materials you send out. These are fantastic. My PreK kiddos will learn so much using these. Thank you so much for sharing with us. I’ve tried to find something like this and actually tried making my own. Yours are so much nicer than mine. Thank you again for sharing. My kiddos will have a better math experience from your sharing. Thank you for sharing your ideas. I really appreciate what you do for our students. Thank you for this Awesome printable . I really appreciate it, this would look great in my manipulate area. Great ideas for Teddy Bear Picnic – lessons, printables, links, We re Going on a Bear Hunt! Teddy Bear Picnic \”We’re Going on a Bear Hunt! Thank u mam for such a wonderful worksheets as i am an indian teacher and it is very difficult to teach all type of children at one place. Thanks for these math ideas! I will use the plastic counting bears cause my class is a hungry bunch. 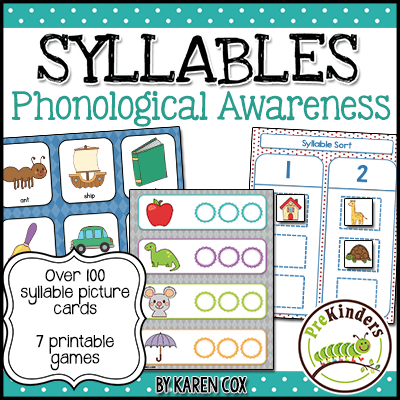 Thank you so much for sharing these fantastic printables! My preschool kids will absolutely love them. So kind of you! !